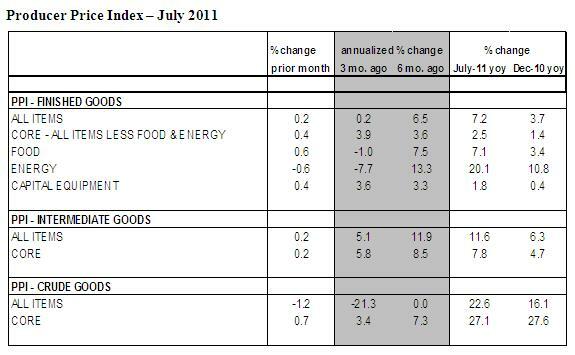 The Producer Price Index (PPI) of Finished Goods rose 0.2% in July after a 0.4% drop in the prior month. The 0.6% decline in energy prices provided a partial offset to higher prices of other items. Lower prices for gasoline led to the drop in the finished energy price index. An increase in prices of beef, veal, and fresh fruits led to the 0.6% jump in food prices during July, following a similar increase in the previous month. On a year-to-year basis, the finished goods price index has risen 7.2%. 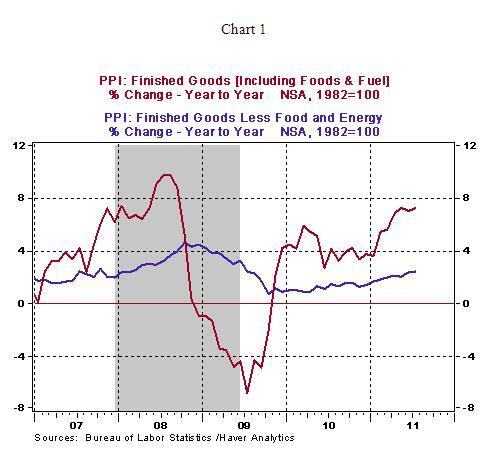 Excluding food and energy, the core PPI of finished goods posted a 0.4% jump in July vs. a 0.3% increase in June. A 2.8% increase in tobacco prices accounted for roughly 25% of the increase in core wholesale prices in July. In addition, higher prices for light trucks (+1.0%) and medicines (+0.4%) helped to raise the overall index. At the earlier stage of production, the core intermediate price index rose 0.2% in July, putting the year-to-year gain at 7.8%. This is a worrisome reading as are the year-to-year gains of finished goods price indexes. 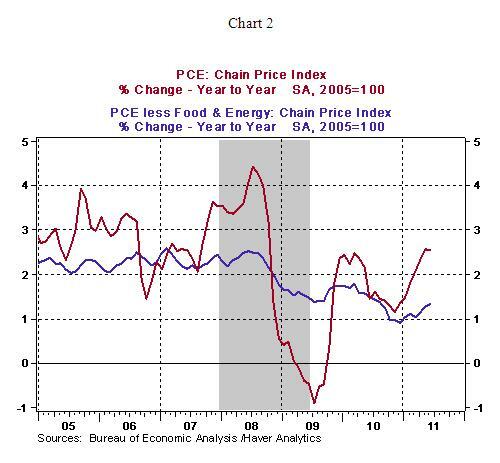 However, the Fed’s preferred inflation measures are personal consumption expenditure price index and the core personal consumption expenditure index. The overall personal consumption expenditure price index has risen over 2.0% due to higher energy and food prices in earlier months (see Chart 2). The core personal consumption expenditure index continues to hold below 2.0%. If the higher wholesale prices are passed through to the retail level in the months ahead, the FOMC would have to weigh its options carefully in the inflation-growth debate. Given expectations of soft growth in the second-half of 2011, demand not inflation is the bigger story in the near term.